Behind every great man is a Honey-Do list. 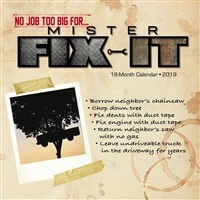 Laugh along with twelve attempts (and failures) to be Mister Fix-It. The full color, large format calendar includes large daily grids; six bonus months of July through December 2018; moon phases; U.S. and international holidays. Printed on sturdy, high-quality stock.